Calling people names is hardly debating. It's a sign that you have no answers. Your whole line of argument has been refuted and thus amounts to nothing. Finally, you're reduced to venting your frustration. That's where you find yourself right now. Is that why you failed to answer my points throughout? People generally choose a character from books, films, mythology or an historical figure for fancy dress parties. If people are going to be offended because a characters colour is used or that a particular culture is deemed to be misappropriation we may as well forget the whole thing and ban fancy dress. No more Cleopatra, Napoleon or anyone else. Why are people preaching diversity when we are constantly faced by division - no cross culture you can't wear a sari or a sombrero unless you are Indian or Mexican, you describe yourself as Afro American, Italian American, Chinese American British Asian just be American or British. Didge wrote: Is that why you failed to answer my points throughout? No. It's because you lost your train of thought. You didn't follow the conversation, and so you ended up not saying anything of importance. Vintage wrote: People generally choose a character from books, films, mythology or an historical figure for fancy dress parties. How does one follow gibberish? How is looking like Samuel L Jackson in fancy dress from the film Pulp Fiction, a racist sterotype? Vintage wrote: If people are going to be offended because a characters colour is used or that a particular culture is deemed to be misappropriation we may as well forget the whole thing and ban fancy dress. No more Cleopatra, Napoleon or anyone else. Art is a complex subject, agreed. Add to that, it's communal in that a given art form has to be accepted by the community as that thing. But when something is simple, and clear, and it is widely accepted as a symbol by the community, it takes on a life of it's own. Lincoln Perry's depiction of Stepin Fetchit has for years, and over many lands, been the symbol of the obsequious black man, who was slow-witted and lazy, and his blackface zeros in on that. Let's go back to my assertion that words are symbols...you would have no difficulty understanding if I called a black man, niggah, would you? A blackface just as plainly says, I am pretending to be a niggah! So we are back to him invoking Blackface, failng to assertain what on earth that has got to do with the character played by Samuel L Jackson in the Film pulp Fiction. Who plays alongside a similar character who is white. Thus two people who have turned to crime, no matter the ethnic group. Which is a reality that we still see to this day happen in society. Showing more and more that relative poverty is more than anything that leads people to crime, or they simple are nasty people. We've been all over this. Go back and read...this time for comprehension. Original Quill wrote: We've been all over this. Go back and read...this time for comprehension. A two page thread, and you're still at the level of asking the initial question? Pathetic. quill if cohen or stein happened to be a well known character from a hit book/film then no it would not be. if you turned up like that and introduced yourself as the average jew then yes. You mean th very same question you have dodged throughout? As well as countless other points I raised to you? I must say I haven't heard of Stepin Fetchit, now if I had known of this character and how he was portrayed and someone came to a party as that character then even I might be offended. I was surprised to find the man playing this character was black having thought it might be an Al Jolson kind of thing. Its all about context though isn't it. Al Jolson was admired by 'African Americans'. You can use a character to make fun of or you can use a character to show admiration and authenticity. 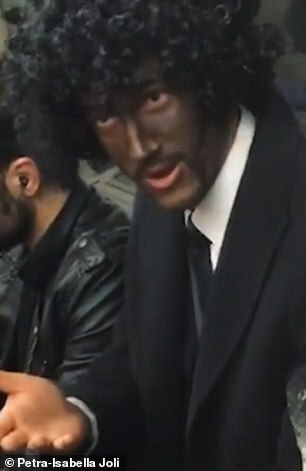 If people use blacking up to make fun of non whites then its unacceptable of course but I can't see a problem where its a genuine attempt to look like a character/historical person. Cohen is such a common Jewish name that the London police used to use as a surrogate for 'John Doe' when the person was known to be a Jew. Again, a symbol. That's where I pulled it from. The point is, it's a depiction identified by immutable characteristics, meant to disparage and ridicule the subject. Vintage wrote: I must say I haven't heard of Stepin Fetchit, now if I had known of this character and how he was portrayed and someone came to a party as that character then even I might be offended. I was surprised to find the man playing this character was black having thought it might be an Al Jolson kind of thing. Its all about context though isn't it. The Stepin Fetchit character was the more clearly disparaging depiction of a black man. As his name implies, he was meant to be something of an lesser human being, as an obsequious, lazy servant. I don't really know how popular the Al Jolson character was with African Americans, because they didn't have popularity polls in the 1920's. Maybe it was popular with African Americans, or maybe that was just pablum that was fed to the public to assuage sensitivities. "They do it themselves..." was a popular retort back when whites felt the need to defend segregationist practices. Blackface has really become an extreme racist trope today. I can fully understand how the underlying tale of the OP happened. That would not sit well in New York, Chicago or Los Angeles today.